After a long day of work, I’m gazing at my laptop screen again; my mind eases back to my last adventure. It started in Denver. I was there on business for a few days and I couldn’t wait to wrap things up and escape into the Rocky mountains; trading the city lights for those of the Milky Way. Many of the river reports I had read reported high flows due to run-off on most of the rivers. I’ll have to fish the Gunnison on my next trip. Trouts Fly Shop in Denver gave me some pretty solid advice, in addition to the advice I got from all of my lovely Coloradoan followers. The day after meetings were wrapped up, I was on the road to the South Platte River. 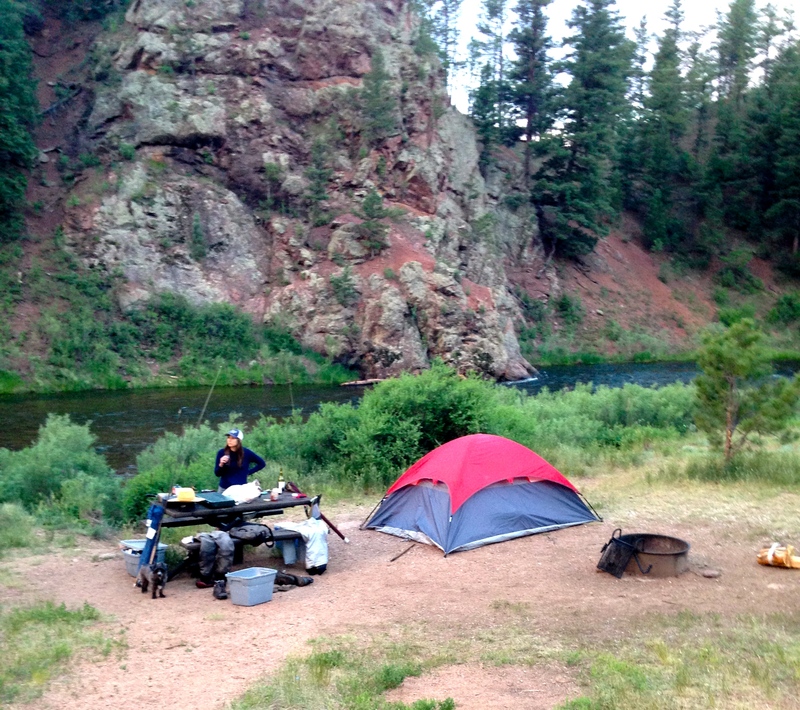 Wine, fishing and camping….pure bliss. An hours drive out of Denver, Deckers, CO was much smaller than I had expected it to be when I’d looked at it on a map. I absolutely loved it. A place where cell phone reception doesn’t exist and there are 4 shops in town, one of them being a fly shop. After buying my Colorado fishing license and sharing fishing tales at Flies and Lies, I headed to find a campsite and fish. Whipping together my tent with the efficiency of an expert and haphazardly tossing together my bedding, camp was set and I was ready to fish within the hour. 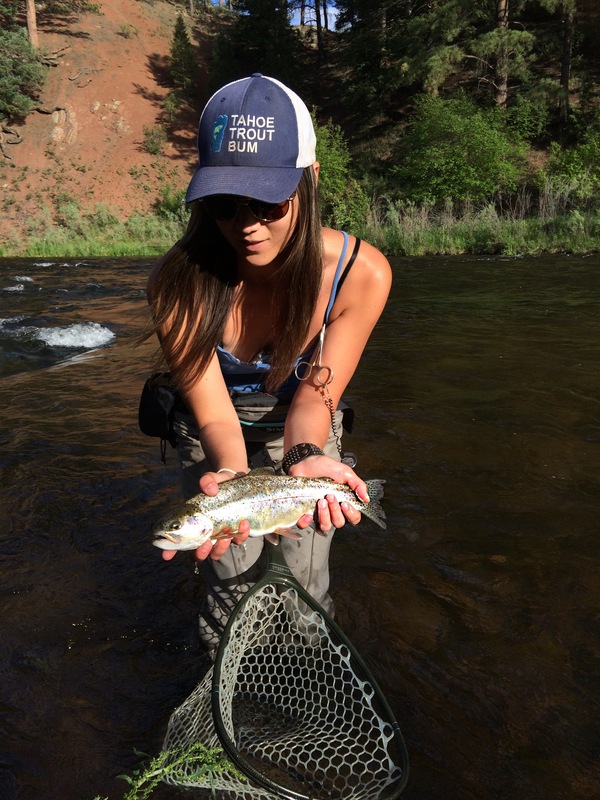 The flows were about 250% above optimal fishing levels, but word on the river was the nymphing was still productive. Typically, I like to drive and hike a bit to find fish that haven’t had every fly and the kitchen sink thrown at them, but the water by my campsite looked too good to pass up. I waded out in a few hundred feet from my tent and made a few casts. The river bed was a very yellow color, with lots of fine gravel. Despite keeping an eye out, I didn’t see any fish. Until I looked directly below my feet. I had two big rainbows following my wake just a few feet downstream. My pet fish. Avoiding the temptation to thrown on a San Juan Worm and fish by my feet, I continued to fish upstream, sans indicator. Frank and Ethel (Yup, I named my pet fish) kept me company until I caught my first fish by dead drifting a salmon fly nymph. They scattered as I landed the first rainbow of the trip; a fat well-fed 16 incher. The rest of the afternoon went by with only one more fish caught, another similar sized rainbow in a riffle upstream from camp. As twilight crept over the canyon, I looked across a the river to a promising bend in the river. The water was too fast to wade out very far, and fishing from the other side wouldn’t give as good of a presentation; a conundrum to be sure. Unless you happen to have packed your spey rod, just in case. I jogged back to camp and set up my graceful 13 foot Anderson Custom spey rod. Second cast out, a few feet into the swing, I felt the familiar jolt lightening through my rod, waited a few beats to make sure the fish has eaten the fly, and then set the hook. Immediately I could tell this fish was bigger than the ones I had caught earlier in the day. My reel screamed like only a Hardy can as the line zipped off the spool. 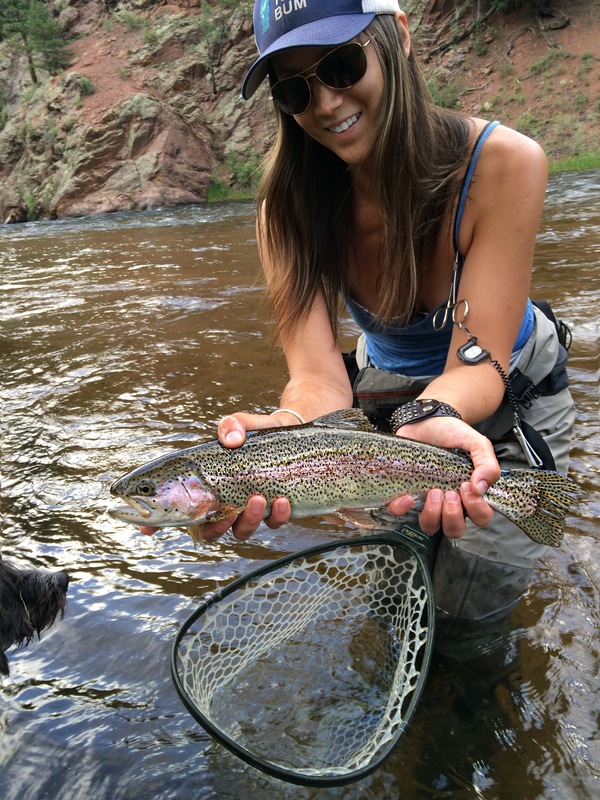 And a few minutes later I was netting a beautiful 21″ rainbow I caught on the swing. Not bad. I knew there was a reason to lug the Spey set up halfway across the country, despite a shortage of space in the car. It just goes to show that when the fishing is a bit slow and the flows aren’t cooperating as much as you would like, there is always a way to productively fish a river. Fishing is a combination of knowledge, observation, skill and creativity. A bit of imagination and thinking outside the box can truly elevate your fishing experience to the next level. Great story and awesome fish!